Sebastien Hue aka Shue13, is a french digital artist who lives in Paris' suburb. Self-taught, he started around 10 years ago when inspired by the likes of Dylan Cole. Sebastien decided to teach himself the ins and outs of digital painting, initially starting out with Photoshop. "I used to make logos for music bands but I eventually progressed deeper into CG graphics, 3D programs and matte painting." A far cry from band logos, Sebastien certainly had a hidden talent for imagining spectacular landscapes. Fuelled by passions he channels his love for science fiction and the diversity of the visual arts straight into his work, seeking to add scale, depth and drama into his intricately detailed designs. ImagineFX Issue 101 FXposé gallery Friday 13th, September, 2013. 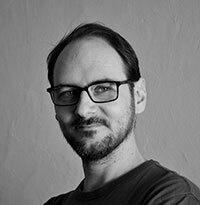 After 15 years of experience in International logistics and business, Sebastien decided to make a U-turn in his career and after a hard transition of two years, he eventually became professional concept artist in 2013 founding is own freelance studio Shue-Digital and found his way among many international clients from publishing, gaming as well as film industry.